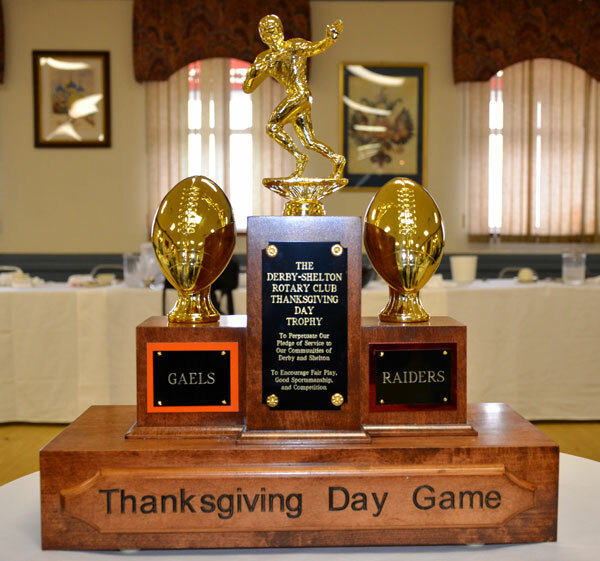 One of the oldest traditions of the Derby/Shelton Rotary Club and the two communities it serves is the annual Thanksgiving Day High School Football Luncheon. The event dates back to at least the late 1930’s and has been a holiday fixture for decades. At one time the local Kiwanis Club took the teams to Yankee Stadium to see the Yankees (Yes Yankees – not Giants) for a game and a steak dinner. Over time, the event evolved into a joint luncheon sponsored by both the Kiwanis and Rotary Clubs. Since the demise of the local Kiwanis club, the tradition has continued and thrived under the sponsorship of the Derby/Shelton Rotary Club. In addition to hearing from the coaches and captains of the football, all senior members of the teams and the cheerleading squads were introduced. Each school also brings along a special guest speaker who played for their school and recounts their experiences and current situations. Click here to learn more about the 100+ years of the game and view the all time results. Click here to see a list of all those who have won the Silver Turkey Award for the game’s most outstanding player. 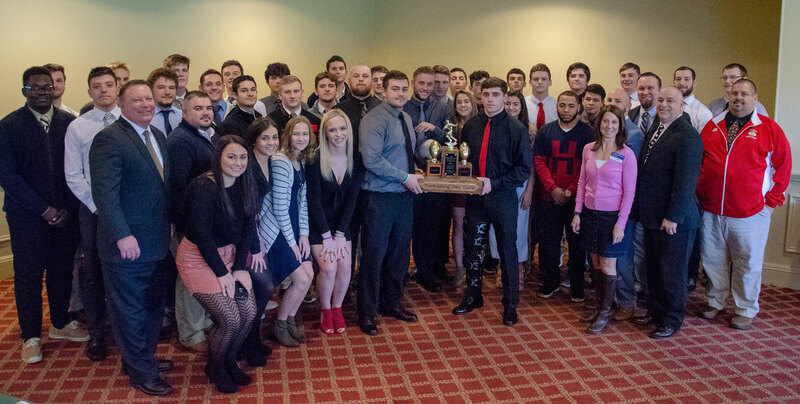 The Derby/Shelton Rotary club not only honors the senior members of the football and cheerleading squads at both schools along with their coaches, but also presents a trophy that the winning team keeps until the next game or until a school accumulates ten points for wins and/or ties. In 1997, Shelton retired the previous trophy after 18 years of competition. The new trophy was designed and made by ex-Shelton football coach Tony Branca. The 1998 game marked the 87th meeting between Derby and Shelton High schools in a rivalry that dates back to 1904 or 1905 depending on which side you ask! The first game where this trophy was up for grabs in 1998 ended in a 7-7 tie. Click here for a story and pictures from the game. Shelton retired the trophy in 2009 with a 33-6 win in Derby. This trophy only took 12 years to retire as Shelton registered 10 wins to Derby’s 1 and there was one tie. Click on the links below to see highlights from some of the past luncheons.